The 20th French Film Festival will grace the big stage once again from 23 and 24 June 2015 (Tuesday and Wednesday) starting 10:30 AM onwards at Ayala Center Cebu – Cinema 4. 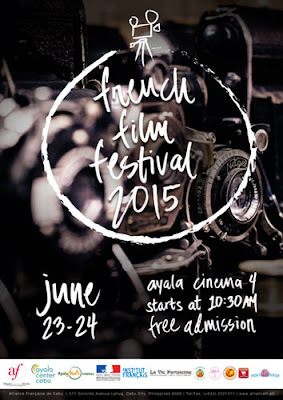 Enjoy the showing of 10 retrospective movies brought to Filipino viewers among the most memorable films from the best French directors with English subtitles. Ranging from drama to comedy, adventure and more. Among the roster of movies, catch La Famille Belier on the first day of the festival. This film depicts one of the dominant characteristics of Filipino culture about putting high value on family more than anything else. World Pizza, La Maison Rose, M.Lhuillier Supermarket Wine and Food, and French Burger.